Baluarte Bridge, built across the deep ravine in the Sierra Madre Occidental mountains in Mexico, is the highest cable-stayed bridge in the world. Image courtesy of the Mexican Government. The bridge, officially known as the Baluarte Bicentennial Bridge, was inaugurated by the Mexican President Felipe Calderon in January 2012. Image courtesy of the Presidency Of The Republic, Mexico. The Baluarte Bridge is built across the deep ravine in the Sierra Madre Occidental mountain range in north Mexico. The 403m tall bridge is the Guinness World Record holder for the highest cable-stayed bridge. It is also the second highest bridge in the world. 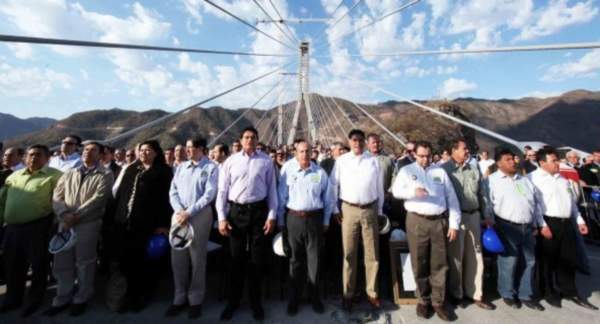 The Baluarte Bridge project was officially inaugurated by the Mexican President Felipe Calderon in January 2012 and is expected to be opened to traffic in late 2012. The bridge is expected to carry more than 2,000 vehicles every day. The bridge is officially called the Baluarte Bicentennial Bridge. Bicentennial refers to the 200th anniversary of Mexico’s independence from Spain in 1810. The bridge was supposed to be inaugurated in the second half of 2010 to coincide with the bicentennial celebrations, but delays pushed the date back. "The bridge is officially the Baluarte Bicentennial Bridge. Bicentennial refers to the 200th anniversary of Mexico’s independence." About $146m has been invested into the Baluarte Bridge. The project was funded by Fondo Nacional de Infraestructura Inicio (Fonadin), the country’s national infrastructure fund, along with the Durango-Mazatlan Trust (Fiduma). Fiduma was to help finance the Durango-Mazatlan highway. The 1,124m Baluarte Bridge is an essential part of the Mazatlan-Durango highway, a $1.4bn new roadway linking the coastal city of Mazatlan to Durango, the capital and largest city of the Mexican state of Durango. Mazatlan-Durango highway itself forms part of the Mazatlan-Matamoros highway axis. The Mazatlan-Durango highway will replace the existing Devil’s Backbone road built in 1940s. The project comprises 63 tunnels and 32 bridges, some of which will be more than 300m high. Once opened in the second half of 2012, the new highway will reduce travel time between Mazatlan and Durango by about six hours. The highway department hopes to increase tourism and improve trade between the two Mexican cities. The Baluarte Bridge built over the Baluarte River carries two lanes in each direction. The bridge is 20m wide. Built at a height of 403m, the bridge structure is supported by nine bridge piers and two pylons. There are 152 suspenders, of which the main span measures 520m in length. The base of each of the two pylons (P5 and P6) measures 18m x 8.56m. The pylons widen at their centre to about 31.30m to carry the four lane roadway and then narrow upwards in to an inverted Y-shape to have dimensions of 8m x 4.10m at the top. With a height of 169m, P5 is the taller of the two pylons. Pylon P6 stands at 156m tall. Construction of the bridge commenced in February 2008. About 1,500 workers and engineers were employed in the construction. 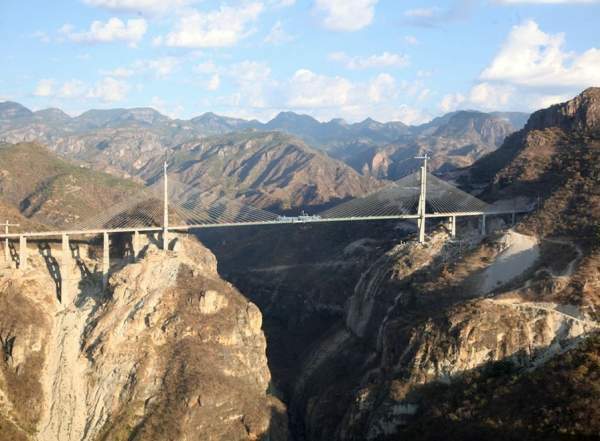 "The Baluarte Bridge is built across the deep ravine in the Sierra Madre Occidental mountain range in north Mexico." It required approximately 12,000t of reinforced steel and 90,000m3 of hydraulic concrete. The bridge’s foundations were laid after mining 447,000m³ of rock. A total of 49 concreting sections with concreting heights ranging between 3.28m and 3.90m were used for the construction of the pylons. A range of formwork and scaffolding for the construction of different bridge piers was supplied by Peri, a German company involved in falsework and formwork manufacturing. A self-climbing scaffold was developed to facilitate the construction of complex pylons. The main advantage of this scaffold is that its platforms can be adjusted according to the angle of inclination. Prior to the commencement of the main work, camps were built to shelter the workers. These included construction of five buildings for offices, bedrooms, kitchens, stores and parking. In addition, there is a soccer field and facilities for water management. The Baluarte Bridge project has been undertaken by a consortium of Tradeco Infraestructura, Idinsa and Corey and VSL México. The consortium was contracted in May 2007 by the Secretariat of Communications and Transportation (SCT) of Mexico. SCT is a national entity responsible for managing commercial road traffic and broadcasting. VSL supplied and installed prestressed concrete, four pairs of form travellers and stay cables. Peri was subcontracted for the construction of towers and piers. UK-based shipping agent and freight forwarder Tuscor Lloyds provided assistance with shipments to the site.